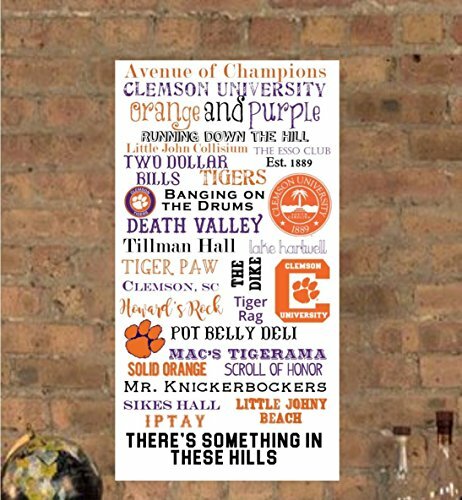 Show your love for Clemson University with this awesome Clemson Subway Art! This makes a fabulous Graduation or Birthday Present! Give a ONE OF A KIND gift you and your loved ones will ALWAYS treasure! Would you like another College sign? Send me a convo and I would be happy to make one for you! IT'S • E A S Y • T O • O R D E R ! HOW TO ORDER: 1. Select your desired canvas size and ADD item to CART. 2. In Customization, add your custom requests OR send an email to jeguiness@gmail.com with: - choice of words + + preferred colors and fonts (see photo for choices). 3. Complete the payment . If this is a gift and you would like us to include a card, please indicate text for the card 4. We will use the art of typography to create your custom piece of art. You will have a proof / preview of your canvas order within 24 hours after receiving your customization request. 5. Once you have approved the proof/preview, we will start producing your art. Your Custom Art is professionally printed on canvas and gallery wrapped with a width of .75" OR 1.5" (your choice) on a real wood frame. This is a gallery wrap with staples on the back. There is UV protective coating over the entire image and it comes ready to hang. Production is 1-4 days and shipping is usually 5-10 days. If you have any questions about this product by PicturePerfectbyJody, contact us by completing and submitting the form below. If you are looking for a specif part number, please include it with your message.